One of the reasons I like iPod is that I will not to be disturbed while listening to music, even though it sounds old-fashioned that someone still has iPod classic or nano. As a 90s, I still use this old school method of listening to my music or audiobooks while I am driving or exercising in fitness room. Though I have iPhone, I still a faithful iPod touch user, regardless of the marketing idea behind it. In recent years, I prefer to listen to audiobooks rather than music before going to sleep, and purchase many audiobooks from iTunes store. Then a thought came in to mind: wanna transfer or sync my iTunes audiobooks to my iPod for listening without being disturbed. However, because the iTunes audiosbooks suffixed with .m4a or .m4b are DRM protected, you may find that it is a little difficult to copy these audiobooks to old iPod classic or nano. 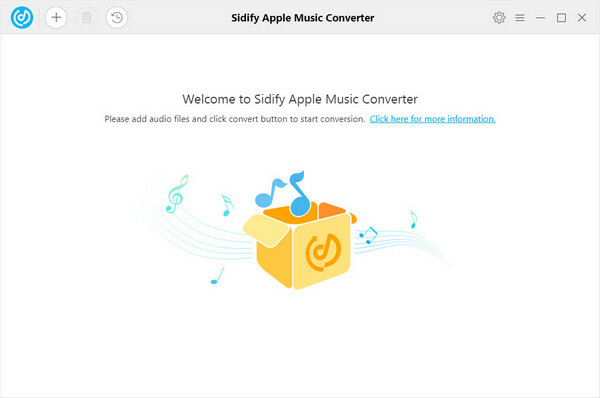 So here we highly recommend you an iTunes Audiobook Converter – Sidify Apple Music Converter to assist you removing the DRM protection from iTunes M4A or M4B audobooks and convert them to unprotected audio files, thus you can easily copy these auidobooks to your iPod for listening whenever or wherever you want. Convert iTunes M4A, M4B/Audible AA, AAX audiobooks to M4A, M4B. 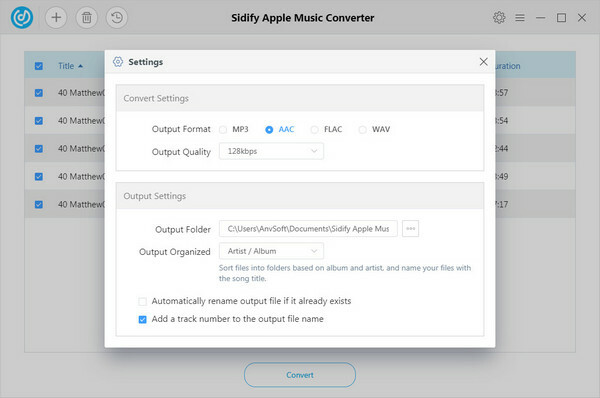 Launch Sidify Apple Music Converter on your computer after installation. Then add iTunes M4A & M4B audiobooks to this audiobook converter by clicking icon or "Click Here to Add Audio", and a window will pop up to show the audio files on your iTunes library. 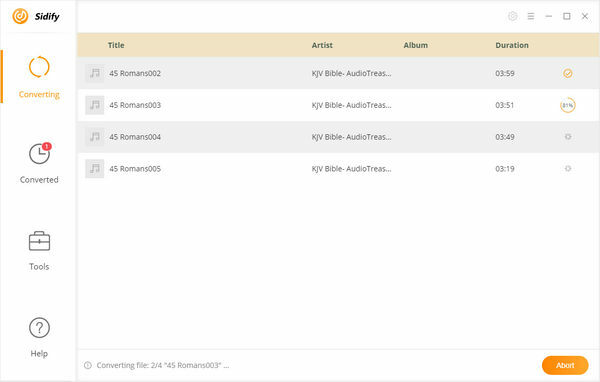 Click "Books" selection on the top left corner and your iTunes audibooks will be listed, then you can choose the audibooks you want to convert from the list. Click "OK" to check the audiobooks you chosen. Click button on the top right corner to customize the settings including output format, output path, output audio quality and conversion speed. Here you can choose M4A as output format. After customizing the output settings, you can click "Convert" button to start converting your iTunes audiobooks to unprotected M4A. 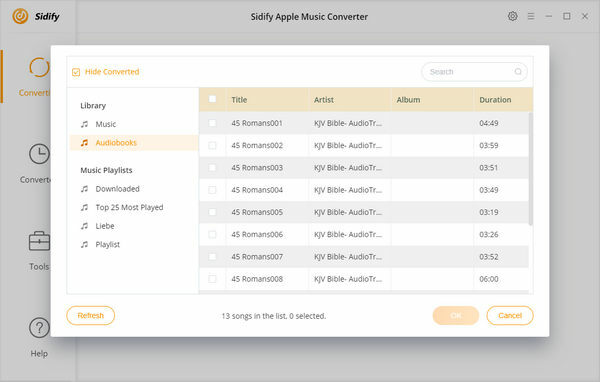 Sidify Apple Music Converter allows you to convert audiobooks or Apple Music at 20x speed. After the conversion process completed, you can click button to check the converted iTunes audiobooks from local drive. Now, you can plug your iPod touch (nano, classic included) to computer via USB cable, then start transferring the converted iTunes audibooks to iPod via iTunes. Or if you want to transfer the audiobooks to iPod without using iTunes, you can try Syncios iOS Manager. After the simple steps above, you will get DRM-free iTunes audiobooks, and you can feel free to transfer your iTunes audiobooks to iPod or other more portable devices. Now, just enjoy your favorite audiobooks freely while fitness or before sleeping.